Writing this XML by hand can be quite challenging. 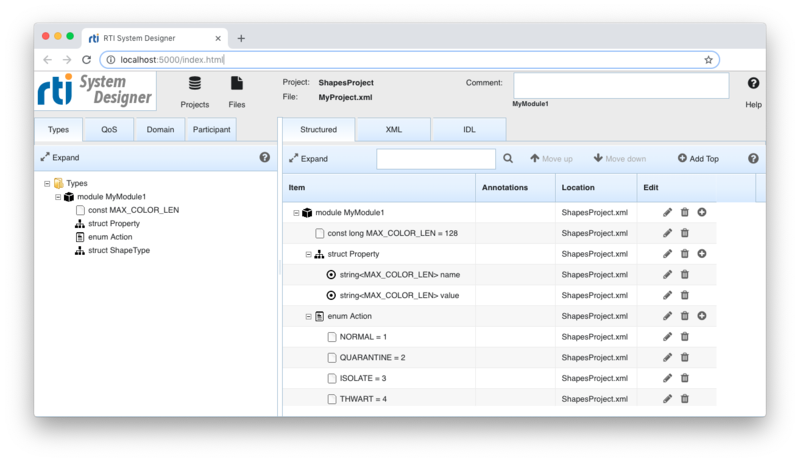 While a good editor with auto-completion capabilities and an understanding of the XML schema provided can be of great help, it is still quite complicated... especially as the project gets bigger and involves multiple files. RTI System Designer can help ease this process and manage the complexity of large systems. Support. This is an experimental RTI product, developed by RTI Research. As such, it is not officially supported, however, we do offer support through the RTI Community Forum where fellow users and RTI engineers can help you. Intent. We’re planning on future development. Feedback. We'd love your feedback! Please visit the RTI Community Forum to provide feedback on System Designer. Project Version Information. This is version 0.3.0 - built for Connext DDS 5.3.1. For information regarding supported platforms and compatibility, please see the documentation. License. System Designer is governed by Section 3e (Evaluation License) of the Software License Agreement. To obtain the latest version of System Designer, please send email request to labs-projects@rti.com. You will then receive the instructions to download the program. If you would like to try System Designer before downloading it, you can access a live version of it on the web here. This will allow you to test a demo version of System Designer and check out its capabilities and features before installing it. Head on over to the RTI Community where you can search through the responses to technical questions and post some of your own! Post your questions, search through our Knowledge Base, and get the most from your DDS experience by joining the RTI Community!